EDWARD Mumbi has revealed that he decided to resign from the UPND because he did not agree with what he termed as a tribal cartel that has colonised and mismanaged Hakainde Hichilema. But UPND general secretary Steven Katuka has charged that those who are leaving the UPND after it failed to win the last general elections have ‘‘no social shame and not worth the trust of citizens’’. Mr Mumbi revealed that Mr Katuka called him yesterday to discuss his resignation and that he informed the UPND secretary general that he could not continue being a member of the opposition party because a clique of tribal individuals had taken control of the party. He said in an interview yesterday that Mr Katuka agreed with his sentiments that the UPND and Mr Hichilema were being controlled by a known group of individuals who were regionally inclined. “Mr Katuka called me this morning (yesterday) and we talked for about 20 minutes in which I gave him a bit of my displeasure in the manner the UPND is being governed and he agreed that my concerns were genuine. 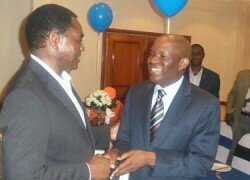 ‘‘There are many reasons why I have left the UPND and one of them is that I did not agree with the tribal cartel that has mismanaged Mr Hichilema. I warned Mr Katuka that we should not discuss my resignation in the media and the least I expected from him and the UPND is to attack my decision to resign,” Mr Mumbi said. Mr Mumbi said the UPND had gravely mishandled the suspension of its former vice-president for political affairs Canisius Banda who he said was one of the foremost leaders to have worked hard to cure the stigma that the opposition party was tribal. He said Mr Katuka had failed to handle his (Mumbi’s) resignation which he said was decent and without malice by resorting to unwarranted attacks. Giving his first reasons for resigning on Tuesday, Mr Mumbi told the Daily Nation that he was leaving because he wanted to attend to family matters. But Mr Katuka said while it was understandable that there would always be movements and defections after a political party had lost its bid to form government, politicians should have the social shame in resigning from their political parties immediately after failing to win an election. Mr Katuka said the UPND members who were resigning from the party were frustrated that the opposition party had yet again failed to form government and could not fathom the idea of remaining in the opposition for the next five years. “There must be a sense of shame even in politicians because it is politics that run national affairs. People have high expectations in political leaders and if one is going to resign from a political party because it has failed to form government, then such a leader has no shame and not worthy the trust of citizens. ‘‘However, Mr Mumbi has the right to leave the UPND but my contention is the timing. He was a devoted member of the UPND just days ago and today he has renounced his membership,” Mr Katuka said. ← How grandpa destroyed my life!